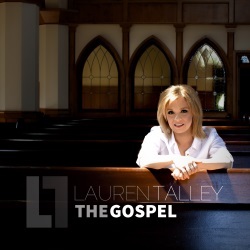 Lauren Talley's new CD, The Gospel, is a bold and uplifting proclamation of the truth on which our faith is founded. Here, the award-winning Southern Gospel artist shares a little about the creation of and inspiration behind The Gospel. Where was The Gospel recorded, and who produced it? I had the vision for this project back in 2015. In recent years I've seen a growing trend in the Church that has really concerned me. We have become so influenced by the culture around us that we have gotten away from the fundamental truths of the faith. I felt it was important to bring those truths back to the forefront of our consciousness as believers—what do we believe, and why is that important? The project was recorded throughout 2016 at various studios, and I produced it from its beginnings to the finished product. Tell us about a few songs that mean a lot to you. I cowrote four songs on the project, my first time to do that, with several of my favorite writers and people, including Kenna West, Tony Wood, Lee Black and Sue Smith. One of those cuts, "I Hear A Song," was written especially for me to sing with Gordon Mote and that's the first single. I also cowrote "Everything" with Kenna and Cindy Morgan, one of my earliest influences as a singer. Cindy and I recorded that as a duet as well. It's such an honest, vulnerable lyric that I think will touch anyone who's at a broken place in life. It touches me every time I hear it. Are there any other special guests on the project? In addition to Gordon and Cindy, Brian Free and Assurance provide some rocking background vocals on "I Believe," and I recorded a stunning song called "What Grace Is Mine" with a new young powerhouse named Riley Harrison Clark, who has a amazing tenor voice. You'll be hearing a lot from him in the next few years. I'm so blessed to have the best singers and the best people lending their talents to this record. What do you hope listeners will take away from The Gospel? We're walking into a new season. The Church is going to experience and see things happening that we never anticipated, and our number one job is go into a dark world and give people the truth of the gospel. My prayer is that the Holy Spirit uses this record to encourage believers to stand strong for truth without compromise, while showing Christ's love. After all, it's the truth of the Gospel that really changes people. 2. "The Cradle, the Cross and the Crown"
3. "I Am Not Ashamed"
4. "I Hear a Song"
6. "The God Who Never Changes"
7. "Our Song Will Be Jesus"
8. "The Blood of Jesus Speaks for Me"
9. "Hallelujah, What a Savior"
10. "What Grace Is Mine"